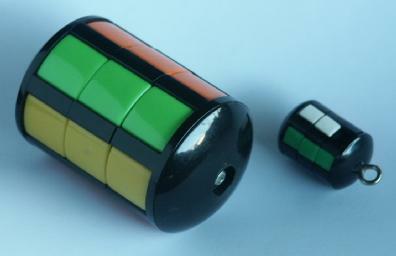 This sliding piece puzzle consists of several discs stacked up into a tower, and they can rotate about a central axle. There are usually 3 such discs (called the Whip-it puzzle, or Puzzle 6) but 6 discs is also quite common in cheaper knock-offs. Along the side of the tower are six columns of sliding pieces, in six colours. The pieces can slide up or down from one disc to another because one of the white pieces is missing leaving a gap. By rotating the discs, the pieces and the gap are moved around to the other columns. 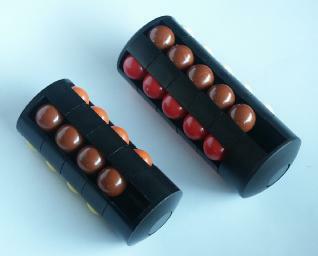 There is a version called Varikon, which has 5 colours with 5 balls of each, placed in 5 columns and 5 discs. There is also a gap but this is in the sixth disc, so one column is in effect a bit longer than the others. 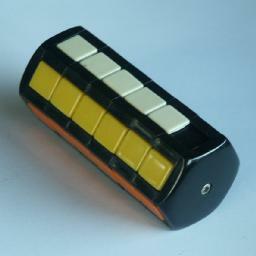 The same puzzle also exists in versions with 4 columns of 4 balls, and this one has been used as a promotional item for Smarties. This puzzle is the simplest in a family of related puzzles which includes the Babylon Tower, and Missing Link. This last factor comes about because it does not matter which colour goes in which column. This leaves 36!/6!6 /5! = 22,251,481,138,642,910,394,240 or 2.2·1022 positions. The 3 layer version has 18!/3!5/2!/6! = 571,771,200 positions. The 5 column Varikon has 26!/5!6 = 135,061,494,343,776 positions, and the 4 column version has 17!/4!5=44,669,625 positions. The tower can be solved layers, disc by disc from the bottom up, but it is just as easy to solve column by column. The latter is much easier to describe, so that is the method used here. Decide which colours the columns will have. To speed things up, you could rotate some discs to partly solve some columns already. Look at the column containing the gap, and determine which colour the column has. Find a piece of the required colour in a different column. If there are none (i.e. the gap is in the completed white column, and the puzzle is not yet solved) then find any piece on the puzzle that is incorrect. Slide pieces in the column up or down until the gap is in a layer next to the layer that contains the piece. Rotate the layer with the gap until it lies above or below the piece. Slide the piece up or down into the gap. Rotate the layer back to its original position, which brings the piece into the column as required. Repeat steps b-g until the puzzle is solved. Note that in practice it is quicker to move not just the one layer, but all the layers above/below it as well.